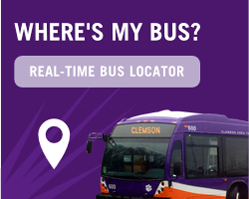 CLEMSON — Clemson Area Transit’s goal of ultimately seeing an entire electric bus fleet hasn’t gone unnoticed by the state. CAT recently received the S.C. Green Fleet Leader Award, presented by the Palmetto State Clean Fuels Coalition. The awards were presented by Maeve Mason and Landon Master of the regulatory staff office at a recent Clemson City Council meeting.